The land in southern Manitoba may be flat as a billiard table, but the ambition here is a mountainous as the Rockies. Ralph Fehr (left), operations manager at Elias Woodwook. Over generations, Germans and other immigrants have exercised their wood craft skills to create scores of successful businesses, large and small. Here in Winkler, Man., 20 km from the U.S. border at North Dakota, there is one large business helping smaller shops around the continent. 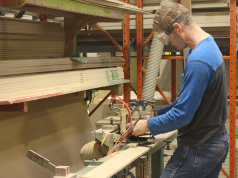 Elias Woodwork produces cabinet doors, as well as handcrafted solid wood furniture, solid wood dovetail drawer boxes, moldings of all categories and designs, and many different accessories. 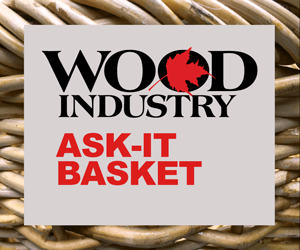 According to Ralph Fehr, majority owner and operations manager at Elias Woodwork, “We tend to be a favourite choice for smaller companies for their production and customizing efforts. Fehr refers to this “mass customization” as the core of his business at the Winkler plant and sister operation in nearby Morden, Man. Winkler, Man., operations of Elias Woodwork. Originally, the company was one of those small businesses that it currently serves. 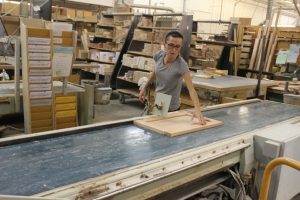 Peter Elias started Elias Woodwork in a small garage on a farmyard to provide cabinet doors to a few cabinet shops within Southern Manitoba. 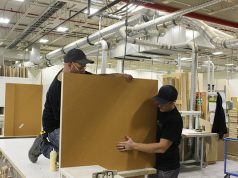 Over 20 years ago, John Fehr and his brother Ralph Fehr purchased the little company, as they recognized a great potential in the cabinet door manufacturing industry. Upon acquiring the company in 1983, it was moved from the garage to a slightly larger building located within the town of Winkler. They remained there until 1987, when they had completed construction of the first building at the current location. At the time, the new 5,900 square foot building seemed enormous. Starting in 1993, they began another construction phase that lasted six years. Upon completion, they came to the realization that you just never seem to have enough building space. 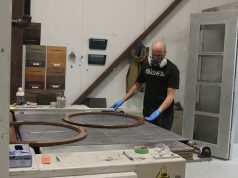 Elias Woodwork presently occupies over 285,000 square feet, including a 28,000 square foot painting area. 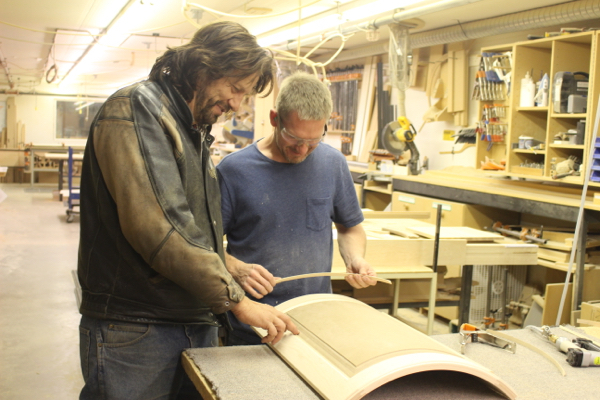 In 2006, Ralph Fehr became the owner of Elias Woodwork, along with several employees as minority shareholders. “We were getting all kinds of offers from multinational companies to buy this place,” says Fehr. Personal family circumstances at the time led him to keep Elias Woodwork and acquire his brother’s shares, while the company’s purchasing manager, maintenance manager, business manager, marketing manager and human resources manager also bought stakes. “My brother John stayed on working and he still does – it is a good relationship,” says Fehr. “I am the engineer and he is the artistic designer.” Fehr explains that he is a structural engineer by education, with a major in dynamic structures. The pace of growth is important to the company as it, like many other businesses, fend off foreign competition. With this growth, Fehr explains, his operations are becoming more automated. Technological prowess and craftsmanship is a huge driver of success at Elias Woodwork on a number of levels, in part to the massive influx of craftsmen from Europe. Hand spraying at Elias Woodwork. Fehr estimates that a third of his employees don’t speak English properly. “These guys are highly educated through the German Fachhochschule system (where employment is part of academic accreditation), more than what we do for apprentices. I have a guy who has a master’s degree in stair building. You can’t get that here. He will tell you things about the molecular and cell structure level of wood, how it behaves with different conditions. 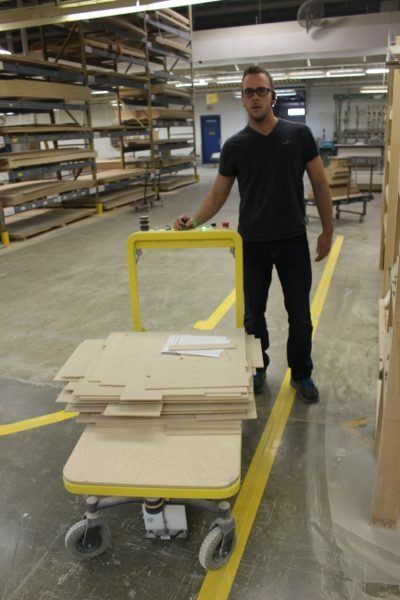 “They are the ones who taught us how to laminate big timber so it wouldn’t split apart. Like when you want to make a 4 x 4 foot post where it tends to want to split down the centre on the glue seam. Fehr says he doesn’t “mind giving the secret out to other people” because of the havoc splitting wood causes throughout the industry. AGV at the Morden plant. 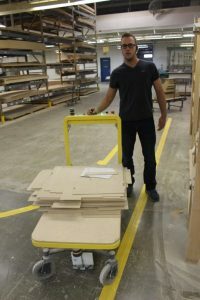 At the Morden plant, in-house engineering expertise has permitted the company to invest in designing its own automated guided vehicles (AGVs) that run on tracks throughout the facility, bringing just-in-time materials to each workstation. 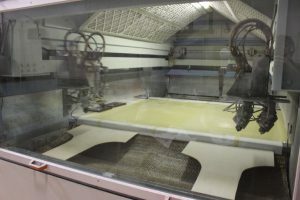 If a part for a machine or AGV is not commercially available, or costs too much commission a metal mold, it also has a 3D printer in its laboratory to make a custom version. This expertise allows Elias Woodwork to create custom automated machinery for specific challenges. An automated system for drawer box sides incorporates a feed-through plunge router, has been developed with native company talent. 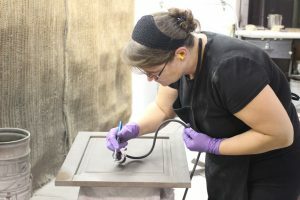 Other developments, such as laminating five-piece doors with vinyl materials and producing curved moldings with high gloss acrylics, are also part of the company’s manufacturing expertise. With this kind of ingenuity, it is easy to see why the company has been named on Manitoba’s 50 Fastest Growing Companies list several times – and that more honours lie ahead.